A wounded Bremerton veteran just graduated with honors from firefighting academy. An injured veteran continued his tradition of serving others with an important graduation Saturday. Retired Air Force Tech Sgt. Daniel Fye was serving his fourth tour of duty in Afghanistan in 2011, when he stepped on an IED. He lost his left leg below the knee, and fought for months of surgery to keep his right leg. Two years later, he was finally able to walk without assistance. Daniel Fye earlier this year at the firehouse. Fye and his family now live in Bremerton. 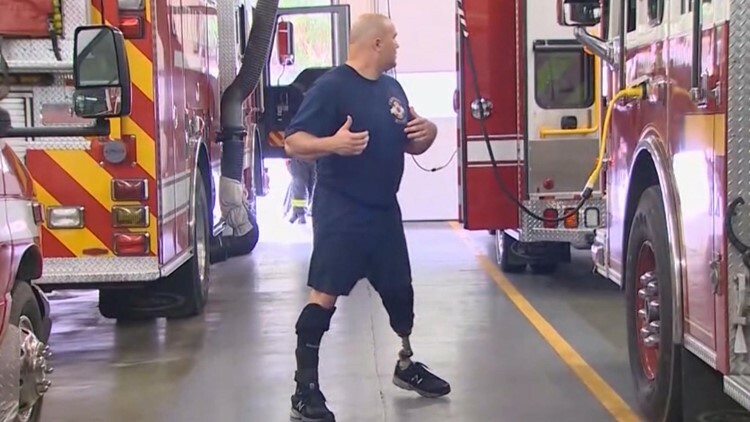 On Saturday, he was able to realize a lifelong dream – he graduated with honors from the South Sound Fire Academy, and was nominated by his class to speak for them. He discussed losing his leg, and how it changed his life. And push he did, through the four-and-a-half month training program. “If you hadn’t seen him without his gear on, you wouldn’t know he had any physical challenges at all,” said Vashon Island Battalion Chief Cari Coll. The graduation ceremony was held on the island. “At one point, his leg came off while crawling out of the search and rescue trailer, and he just had the best sense of humor about it,” she added. Nicole said she was amazed to see him go from struggling to walk – to climbing ladders and fighting fires. Fye plans to volunteer with Central Kitsap Fire and Rescue for the time being, and attend EMT school starting in February.